d4d6d8d10d12d20: It Begins! Welcome to d4d6d8d10d12d20 ! It Begins! Welcome to d4d6d8d10d12d20 ! Welcome to the inaugural post for d4d6d8d10d12d20 ! 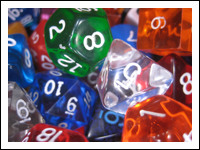 This blog is primarly about role playing games, specifically Dungeons and Dragons, Pathfinder RPG, and the tactical combat simulation game Classic Battletech . Its not much, a few seconds each, but hopefully those will serve as a teaser, for anyone reading this first post to take a second look. They're just Intro and Outro video segments I'm going to be using to bookend my videos which will be published here and at the d4d6d8d10d12d20 youtube channel . Feel free to share posts using the provided social networking buttons, as well as follow the site using the dice links below the site logo above! ;) Whelp, that's all for now! I hope you enjoy the site and thanks for dropping by!